UPDATE December 2018: The tangle Sampson has been added to the site. Good News! 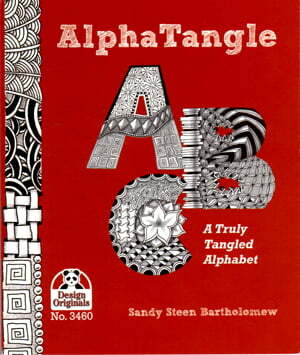 Sandy Bartholomew’s teeny-tiny AlphaTangle – A Totally Tangled Alphabet has just been republished by Suzanne McNeill’s Design Originals publishing company. It’s a fun “new and improved, revised and updated” edition. Sandy has added a list of basic supplies and simple steps for getting started, along with a few drawing tips and 6 pattern mini-how-to’s: Knightsbridge, Keeko, Pearlz, Printemps, Hollibaugh and Ennies.